When looking for a suitable venue for your group you need to ensure that the centre can deliver a programme that is capable of fulfilling the needs and expectations of your young people. 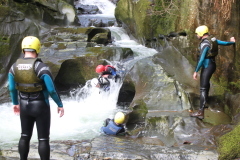 We feel that we offer an unsurpassed range of outdoor adventurous activities that allow us to provide experience for a wide range of young people and adults. Our staff are skilled in delivering activities at an appropriate level for your group. When you phone to make contact with us we will discuss the expectations of your group and ensure that we construct a course to fulfil these requirements. You are free to make as much or as little input into the designing of your activity programme as you wish. In terms of value for money youth groups tend to visit us during school holiday and weekend periods and because of this we offer great value visits with a fantastic range of activities. Availability for most group sizes. Budget Self catering option available. Our programmes provide a full day of adventure activities from 9.00a.m. - 8.30 p.m. All activities are provided in house by our fully qualified and experienced staff team. We can alter the level of delivery to fit in with the age and experience of your group. Activities available include air rifle shooting, target archery, field archery, assault course, orienteering, abseiling, crate stacking challenge, hiking, climbing, gorge walking, coasteering, swimming, inland kayaking, canoeing, sea kayaking, campcraft, raft building, team building tasks, . We regularly work with youth groups that include cubs, scouts, brownies, guides, boys brigades, girls brigades and youth clubs. If a suitable area is not displayed for you, or you would like to discuss other options please do not hesitate to contact us. Most groups ask us to organise the ferry travel for their group, we do this through a local travel agent Isle of Man Event Services Ltd. This ensures that your holiday package is fully protected.